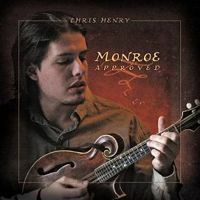 Monroe Approved: Chris Henry has crafted a magnificent collection of original tunes, as well as a good number of Monroe-penned numbers, including the title cut, the "Monroe Approved" medley. Listen closely and you might even hear the ghost of Bill Monroe! Guest musicians include Ronnie McCoury, Jason Carter, Mike Bub, Casey and Red Henry, John Hedgecoth, Alan O'Bryant, Charlie Cushman, and Robert Bowlin. We no longer have any physical copies of this CD in stock. Do Not click the button to the left. Please use the buttons below to download the CD from CD Baby or iTunes. Read reviews of Monroe Approved here. Listen to "Whitfield Breakdown" here.